The Excel to Google Earth (E2G) thematic mapping tool was developed to display maps in Google Earth using Excel spreadsheet data for administrative divisions (e.g., provinces and districts) without the need for a geographic information system (GIS). E2G 3.0 is now available in both English and French for 50 countries, with a focus on PEPFAR countries, and contains a variety of enhancements. 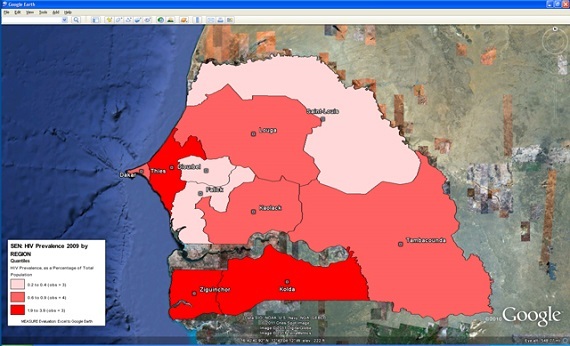 The tool will enable decision makers, program planners and analysts at all levels to display their Excel-based data for administrative divisions on a color-shaded map. This can help overcome many of the barriers that have limited the use of mapping for decision support and M&E. There are no plans to update the tool or the boundaries during MEASURE Evaluation Phase IV. E2G 3.0 is a free Excel macro, and all that is required to run it is a copy of Microsoft Excel (version 2007 or 2010) and a copy of Google Earth (version 6 or 7), which is available as a free download. The macro will run in Windows 7, Windows Vista, or Windows XP. The E2G macro must run in a spreadsheet that contains data for administrative divisions (e.g., percent OVC by province, HIV prevalence by district, etc.) as well as unique names for each of those administrative divisions. Launching the macro will activate a step-by-step wizard that walks the user through a quick series of selections, such as selecting the type and number of classes and choosing which colors to display on the map. Once the user has defined the elements of the map, the wizard creates a compressed KML (KMZ) file for display in Google Earth. When opened in Google Earth, the KMZ file can be printed out, saved as a JPEG file for inclusion in reports or publications, or stored in a Web-accessible space. The mapping tool requires the Excel spreadsheet containing the data to conform to data schema best practices. This means that each record must correspond to a unique geographic identifier, in this case a unique administrative division name. Structuring the data in such a standardized way makes them easier to maintain, analyze and update. This leads to more reliable data sets and a stronger data infrastructure. The tool now includes an additional macro called the S2E (Shapefile to E2G) which enables the user to convert any existing shapefile for use with the tool. If the boundaries provided here are not adequate for your use, feel free to use your own.